This cake was for my coworker's High School graduate son. This is a double chocolate cake. It consists of two round 8X2 pans and one 8 inches cake Pirex bowl. This bowl worked perfectly being I did not have a cake pan of that size. The cakes were filled with chocolate hot fudge and caramel. I stacked them and used a dowel in the middle to prevent sagging to either side. I used a card board to separate bottom cakes to the "bowl" upper part that. I covered them on white buttercream. 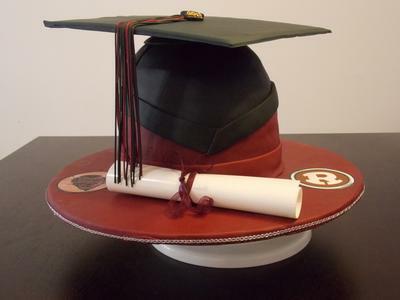 I colored the fondant black and maroon which were the school's colors. The maroon, I had to make it myself. I mixed purple red and very small amount of black until I got the desired color. I covered the base of the cap with the maroon fondant . The bottom of the cap, I used black fondant giving it the "V" shape that it sort of looks like on the real cap. Then, I did a overlaid of fondant on all of the edges, just to step up the look. The mortarboard was initially done with sugar wafer cookies covered with fondant , but it dropped on two of the four sides and I did not like it at all, so I re-did it using just dried black gum paste. For the tassel, I used an extruder. I separated the colors (threads) and then blended them together. I traced and cut the "2013" numbers and painted with gold dust and vodka. I used 3 circular boards taped them together to support the weight of the cake. I used maroon fondant to cover it. I used a very small size silver ribbon and attached it with edible glue just to give it a little punch. I printed the school logos on sugar sheets and put them on both sides. For the diploma, I actually printed a message from the parents to him, on a sugar sheet. I did this extra for them; I actually wrote a message that I could have said to my own son. My son is 24 and he was deployed that same day; I really gave them a message from the heart. My coworker was beyond pleased with the cake and moreover with the message. She read the message to him out loud at their party, she said that everyone was either crying or holding it in. He loved the cake and he could not believe that it was a cake. She said that several people were trying to get the cap off the cake to try it on thinking it was his real cap. 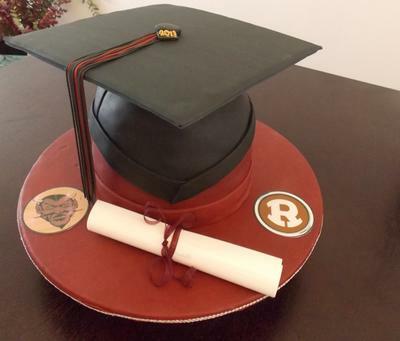 They had to put a paper note saying that this is the cake, don't pull the mortarboard up. Oh Wow! This is yet another of your masterpieces! You don't cease to amaze me how life like are your projects. I am as impressed as I am proud of you. The only terrible thing is that my 1st granddaughter graduated from High School this past Sunday and I have loved, loved, loved to have one cake just like this one to celebrate her. Know that your son is in the Hands of God! The same One that is guiding yours hands to make extraordinary things likewise will favor, protect and guide him to do incredible things. Your job is always so neat and awesome. You are very talented. I'll bet they loved it. Keep it up.